The alert popped up on my Whatsapp, a plane had gone missing on the way from Chitral to Islamabad somewhere near Abbotabad. Minutes later, the same sender informed that the plane had crashed with 47 people on board. Like to many such alerts from this friend, who is a security expert and hence often the harbinger of bad news, the response was Inna Lillahi Wa Inna Ilaihi Rajeeoon followed by a forward of this tragic news to others on various groups etc. Yet those 47 people remained just numbers that often pass on my screens. Then came the news that Junaid Jamshed and Saeed Anwer might have been on their way back from Chitral. Suddenly the numbers became real people, a connection that made the tragedy all so real. Soon the passenger manifest was all over the media and it was confirmed by connections in the Tableeghi Jamaat that Saeed Anwer was still in Chitral but alas Junaid and his wife along with several other members of the Jamaat had indeed been aboard that ill-fated flight. Like many who grew up in the 80s and 90s, Junaid Jamshed was a common name. From the time the Pakistani pop band Vital Signs rose to prominence by releasing what became a prominent Pakistani anthem, the handsome Junaid Jamshed become an idol for young boys and a heart throb for the girls. His voice crooned out songs that stirred the soul and were often listened to on repeat throughout my teens. Concerts were aplenty in those days and I would never miss a chance to catch Vital Signs live on stage. As I entered college in the fag end of the 90s and subsequently went on journey of religious awakening, I stopped listening to music and then restarted as I struggled with a new me. It seems in the years that as I was struggling so was Junaid. After Vital Signs broke up, there were rumors abound that Junaid seemed to have drifted away from music but then the year after he suddenly was back in the industry as a solo artist and it was not until 2002 that he officially announced he had left music for good. The man who had inspired many subsequent names to join the industry was no longer a part of it. His renouncement of music led to the start of a successful business career as he entered the fashion field with the help of an entrepreneur Sohail Khan. This business venture now gave Junaid the support he needed and soon the poster-boy of Pakistani pop became the public face of the Tableeghi Jamaat. Wrapping up that little history lesson up there, what did Junaid Jamshed mean to me? Junaid to me characterized the struggle to surrender. The same struggle that started for me somewhere in 1998 and that to some extent still goes on today: the struggle to bend my soul to follow the Commands of Allah (SWT); the struggle to mute the Disco side and to enhance the Maulvi side of me. I never got a chance to properly meet Junaid after he became a Maulvi. I did reach out to him when I was asked by some friends in the Learning & Development industry to invite him to one of their upcoming youth sessions which they wanted to have a spiritual side as well. Sadly that event never materialized and Junaid and I never met. However, during our brief interaction for the youth event he came across as a very caring and helpful person. Today as I write this, I wonder that maybe I should have taken a bolder initiative and connected more aggressively with him. Maybe I would have learnt much from him, from his struggle to give up fame for religion and his struggle to handle a different fame that came as a religious figure and the many issues that seemed to hound him after he did so. I could have also learnt much from his struggle to contribute more to society. Sadly that chance is gone. All that is now left is to learn from his death. How he was out in the path of Allah (SWT), trying to inspire people to turn to Allah (SWT) —- and how eventually Allah (SWT) chose to take him back while he was on that Path: a martyr in sha Allah. Take some time out, sit in a peaceful location, and listen to this recitation. If you read the subtitles of the meaning it will make the impact much more profound. And imagine how amazing it would be if in every prayer we could understand of what is being recited and get this feeling. May Allah (SWT) grant us the motivation for learning this language. 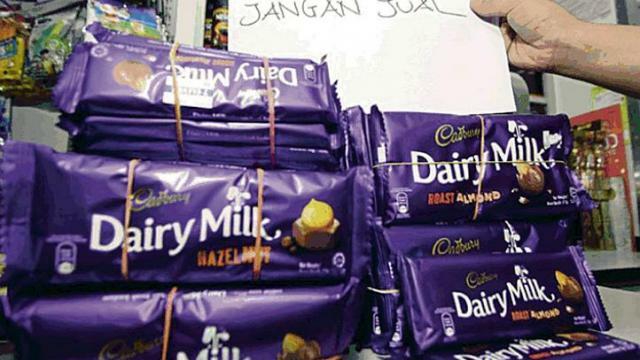 And now Malaysia authorities have cleared Cadbury of any traces of Pork DNA. But most consumers will likely remain wary of products for some time until this fades from memory. The cloth of your shroud may already have reached the market …. The cloth of your shroud (kafan) may already have reached the market …. what preparations have you made? Youtube and other streaming video providers provide an amazing collection of talks and lectures on a broad range of subject. Since my free time in front of the screen is limited and most of these are primarily audio clips that do not require the visual part, I download them and convert to MP3 to be listened to on my Blackberry whilst driving. This morning I started listening to a talk by Nouman Ali Khan that BLEW ME AWAY! My first reaction was I know just who all this would be perfect for. Then I caught hold of myself. I realized that the only one I should be worried about is myself. And at that point NAK said that exact thing. Don’t think of who this lecture would be perfect for; it is perfect for you. You need to listen and act on it! While I only heard the first 20 minutes or so of the lecture it had a great effect on me and I thought I would share it with everyone as it would be extremely beneficial for all. May Allah help us listen, understand, and implement the advice in this talk. Aameen. So what is OUR input? Well for the average person (myself included) it is the junk we watch on TV, the music we hear in our environment, the violence on we see on TV/streets, the negativity of those around us, the lure of scantily clad models on billboards, etc. How does all this affect our outlook/output? Given that our input is not pure, can we expect our output to be pure as well? And in the end, our future, which we all crave to be Jannah (Paradise), is severely affected by this pollution in our input. So should we not be looking to reduce the fitnah and the haram in our input in order to improve our deeds (output)? However, remember that at the end of the day it is the grace and mercy of Allah (SWT) that will enable us to protect ourselves, clean our input, and purify our output. May Allah (SWT) help us cleanse our input and make our deeds those which lead us to Jannah. Qari Muhammad Qayyam (may the mercy of Allah be upon him) related that a great deal of fighting and bloodshed had started prior to the Indo-Pakistan partition of 1947. He said that a very beautiful daughter of a very rich man in a certain community stepped out of her house to visit her aunt, who lived no more than a few streets away. Suddenly a riot erupted as she had gone halfway and she found herself trapped with apparently nowhere to go. She saw a mosque nearby and quickly went inside, sitting in the women’s section. The rioting continued late into the night and this girl did not know what to do. The custodian of the masjid was a very young student there and late at night when he walked through the masjid before locking up he noticed this beautiful young lady. He was a respectful young man who feared Allah and so politely asked her to leave, saying that if she was found there then both would be dishonored and thrown out. She pleaded with him because of the extreme danger outside and so he agreed that she could spend the night, and sat down to study at the opposite end of the masjid. The girl was unable to sleep with the events of the day in her mind and so watched the young man sitting studying by candle light at the opposite end of the masjid. She kept watching him and was very surprised at something she saw. From time to time this young man would extend his hand and keep it over the open flame, only withdrawing it when the flame obviously became unbearable. He then would resume his studies and continued this throughout the night until the dawn broke. The girl left the masjid and reached home, calming her parents’ fears as to what had happened to her. She also confided in her mother that she wanted to marry the custodian of the mosque near their house. She related the night’s events to her parents and said that only such a man with true fear of Allah in his heart can be true to his wife. Only such a man who truly fears Allah can fulfill a wife’s rights properly. Hence the poor custodian of the mosque earned the daughter of a rich household in marriage. He received this honor not because of his looks but because of his character. Everything disintegrates and turns to dust but character remains strong. Honor is not bestowed because of handsome clothes or beautiful jewelry but because of what is in the heart. Knowledge is only beneficial when it is captured within the heart, and not merely written in books. Oh you who believe, fear Allah as He should be feared and die not except as Muslims. Traditionally most translations of the Quran have an interpretation similar to the above. However, the real meaning of the Arabic word Taqwa can not be summed up as fear alone. It is a combination of fear, respect, love, and obedience. The concept of Taqwa is both a motivation factor to do good and a deterrent to stay away from all that is evil. Thus, it is best summarized as “Consciousness of Allah (SWT)”. A person who has Taqwa has the firm belief that Allah (SWT) is watching all that he does. Thus, any and all actions are thus controlled and done from a conscious level of thought. O ye who believe! Fasting is prescribed to you as it was prescribed to those before you, so that you may develop taqwa. If one were to take the traditional translation of “fear” it would not make sense since fasting should not incite fear. However, fasting does help man attain consciousness of Allah and the things around him. Ramadan is a month where taqwa of all muslims increase, as they fast and increase their prayers, their charity, and other forms of worship. As Ramadan draws to a close and we enter the bottom of the ninth so to say, let us pray that Allah (SWT) makes us among the Muttaqun (those who have Taqwa). Aameen.